This is one of my favourite 2016 reads! I had pushed reading this book because either I found another book to read, or I tried to convince myself that it wasn't as interesting as I remembered it to be. But, when I began the first page, I fell in love with the characters, Prythian and everything in between all over again. I completely forgot how great this series was, and now I regret not reading it earlier. Or not, since I have less time to suffer between now and the next release date. Following Amarantha's death, things haven't gotten any better, as Rhysand tells us. War is brewing, and the King of Hybern is at the centre of it all. I'm still not quite sure what his motives are, but whatever. The bad thing is that he has control over the Cauldron, so things are dire. So, Feyre has to work with Rhysand and his "circle" to figure out a way to nullify the magic of the Cauldron before stopping the King of Hybern. Not as easy as it sounds. Feyre has it bad. She still suffers from the traumatic experiences she went through under Amarantha (can't blame her!) and she has nightmares every night. Tamlin knows about this all, but doesn't offer to comfort her or do anything. Great boyfriend you got there Feyre. During the first part of the book, we can see Feyre slowly descending into madness and despair, trapped in the arms of the one person who was meant to be her saviour. I think that is what is so great about Maas' writing. In the first book, we think that Tamlin is perfect for her and we also see him as kind and gentle, but in this book, that illusion is shattered. Tamlin becomes Feyre's possessive jailer and we watch her crumble to pieces. But Feyre takes a stand, leaves and stays gone. That took a lot of courage and I think that was a really good step forward for her, especially since her time in the Spring Court had really threw her off balance and twisted what she thought was right. Which leads on to my new ultimate ship! Move aside Tamlin, because Rhysand is here! I was shipping Rhysand and Feyre since their first monthly meeting. Rhysand is everything Feyre needs and wants. First, he respects her boundaries, unlike a certain someone. Also, it's obvious that Feyre is relaxed with him, so their relationship is friendly and playful. In the end, things escalate and they fall in love! Finally - one of the few ships I ship that is actually canon. But that isn't all! *Spoiler alert* We find out that Rhysand and Feyre are actually mates. YESSSSSS *Spoiler over* I'm liking this ;) Unfortunately, there were some bumps in their relationship, such as when Feyre left Rhysand alone in the mud after healing him. NOOO my baby :( On the bright side, they make an excellent team, as demonstrated by their huge act at the end of the book. Rhysand is also very different from who we believed he was. Straight away, we can see that he isn't evil, nor is he cruel. All along, it was just a mask - a defence. He's just as insecure as Feyre, which is what I think really allowed them to connect. I really loved the slow unravelling of Rhysand's real personality, shown through his care for Feyre, what he sacrificed to save his friends, and his relationship with his inner circle: Mor, Amren, Azriel and Cassian. I can't even decide who my favourite is out of the four, but I think I'm leaning towards Mor. She's pure awesome! The whole family is filled with complicated relationships, but they all love one another and will die for one another, and I think that is exactly what Feyre needs: a family that will stand by her no matter what and will not let her down. The ending was so good! Unlike the many painful cliffhangers we get these days, this one was a bit better. Of course, I'm still dying for the next book, but it wasn't as bad to bear. Yes, Feyre and Rhysand have been ripped apart, but all for good cause. I nearly had a heart attack when *spoiler alert* I thought that the king had destroyed their bond. Phew! He had only destroyed the bargain; the bond remains intact! I was so worried that they would be cruelly torn apart just hours after their bond :( *Spoiler over* War is coming - it's inevitable. How many more sacrifices have to be made? Who will not make it to the end? 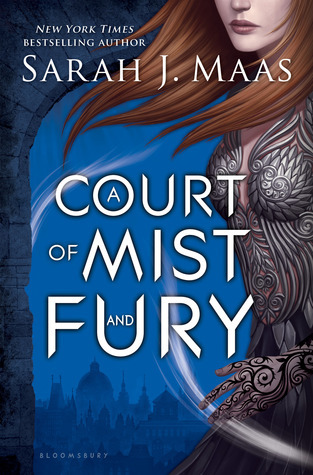 I'm sure Feyre will survive her current stay with Tamlin again, since she has something to look forward to, something to get her through the days: Rhysand <3 This ship will be the death of me :D I really like the idea that Feyre will be a spy in the Spring Court household and destroy from within. Now that is a cunning strategy - one that Tamlin will be blind to. I know Lucien doesn't trust Feyre, but he has to do so. I so glad you loved it! I've been trying to psych myself up to write a review for this for like a month! There are just so many awesome things in it and I don't know if I'll be able to do it justice :) I really loved how Maas shaped Feyre's love interests as well. Case in point: she completely eliminated the possibility of a love triangle because we see how Tamlin's time Under the Mountain changed him just as much as it changed Feyre (only for him, it turned him into a control maniac). Which, of course, makes way for Rhysand!! That moment when Feyre caught the Suriel and then at the cabin... my heart!! It was just so perfect :D Anyway, I'll just be quiet now and go read it again hehe :) Lovely review, Cloe! YESSSS. Feyre and Rhysand!!! There is no such ship as Feyre and Tamlin anymore. That ship does not exist. At all. Not after everything Tamlin has done. There is only Feyre and Rhysand!